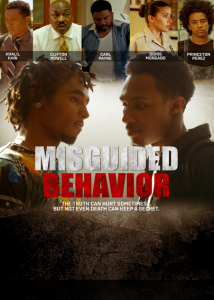 Misguided Behavior is the story of two fathers, the teens in their lives and a decade old lie that affects them all. As a cop Michael Miller (Khalil Kain) is earnest and sure as he rises through the ranks of the police department. But as a father he is uncertain as he struggles with his wife about the best way to parent their teenage son (Elijah J) who is desperate to conceal some barely hidden abuse. The son’s secret we soon discover is the cruelty he frequently receives by a bully at school. However, this bully (Malek Payne) is not without his own torments. His own home where he lives with his widowed father (Carl Payne) is a source of unrestrained guilt, abuse and dark secrets. The tales of these teens, their fathers and the women who orbit their worlds leads to a shocking climax of ultimate decisions made by these to troubled young men.